Evil is one of the aspects that grab our attention in the world literature. It goes hand-in-hand with Friendship, Love, Fate and Death. Sooner or later, every reader will get a chance to have a so-called “date” with Evil once he/she dives into the world of the book. Unfortunately, none of us can predict the exact time when we meet tête-à-tête with Evil or which form it will eventually take. Usually it appears in the form of a human being with sometimes beautiful charismatic nature. Magnetic smile, good sense of humor and sometimes too good to be truth deeds – you won’t believe what kind of mask Evil can put on. Ouch! You believe its dirty eyes and simply get into an evil trap! Let’s make a small tour into the world of the most known evil characters that keep winning our hearts even though being rotten to the core. 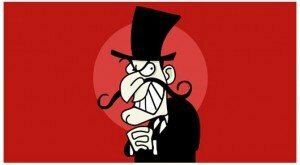 Robert Louis Stevenson is a world acknowledged creator of evil characters. Long before the time we got to know the “Stockholm Syndrome”, Stevenson had a perfect understanding of the way evil is bonded with its victims. Why do people stay caught in dangerous relationships? Just like any of us, Jekyll gives Evil numerous chances to redeem itself. Evil is isolated. In Bram Stoker’s masterpiece, being all alone is almost like offering your pale neck to a blood sucker. Mina is attacked by the famous count only because she stays home alone. It’s easier to get the souls of those who are cut off from the others. Nonetheless, Dracula proves that Evil is also craving for participation of the others in order to slowly stick its teeth into its veins of life. Evil lives as though the whole life is a motion picture and Evil plays the leading role. Patrick Bateman, a yuppie murderer, cannot boast of having the brightest personality. His primary emotion is absolute emptiness and boredom. Are the people really crying, because their wounds cause them pain? Not to our “star”. Evil is absolutely sure everyone around is fake. Just like he/she is. Readers have been discussing Iago for centuries. Iago wasn’t driven by ambition or revenge. To my mind, this character was driven exceptionally by “motiveless malignity.” It seems like he likes both the process and the outcome of Evil, which gives him a solid feeling of dominance. Lucifer described in “Inferno” is an amazing amalgamation of everything mentioned above. Lucifer is covered in ice, isolated and is in just as much agony as all the sinners he keeps in his mouth. A once paradise being, Lucifer is still getting through flashbacks, recalling the moment he wished to establish his throne high above God.